This book positions the capabilities of IBM® System p™ to virtualize Linux® infrastructure services for server consolidation using Advanced POWER™ Virtualization features. It discusses the benefits of virtualization, the Linux infrastructure services workload, planning, and configuration of a virtualized server environment, and the various tools that are available. 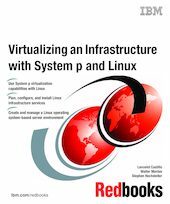 This book can help you plan, configure, and install Linux infrastructure services on System p platform and use System p virtualization capabilities with Advanced POWER virtualization features. It also covers various topics on how to configure Linux built-in infrastructure services, such as DNS, DHCP, firewall, and so forth, and the different virtualization management techniques that are available on System p.
This book is intended as an additional source of information that, together with existing sources referenced throughout the book, can enhance your knowledge of IBM virtualization technology. While the discussion focuses on the Linux operating system, you can extend the basic concepts to other operating systems running on System p. The information in this book is not intended to replace the latest marketing materials and tools.